Epoxy casting resins for casting and encapsulation. 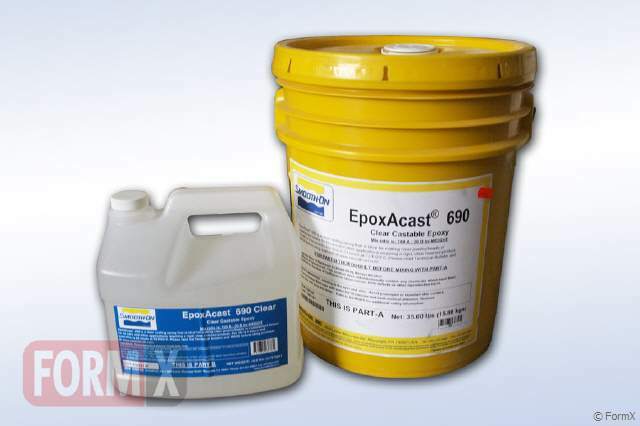 The EpoxAcast series are general purpose casting epoxy resins that are low cost and versatile. They features a low mixed viscosity for minimal bubble entrapment. Choose Fast, Medium or Slow catalyst to fit your project. You can also use HT Hardener to give your castings higher heat resistance. Trial Size PART B ONLY When used with EpoxAcast 650: Mix ratio: 100A:10B by weight Pot Life: 3 hours - Cure Time: 24 hours followed by heat cure schedule - see technical bulletin Net Weight : .4 Lbs. EpoxAcast® 670 HT (formerly 20-136) is an epoxy casting compound which offers high heat resistance up to 350° F/177° C if post cure schedule is used. EpoxAcast® 670 HT features a relatively low viscosity that ensures minimal bubble entrapment. EpoxAcast® 670 HT also offers an extra long working time of 3 hours. Castings cure with negligible shrinkage and are very hard, very strong and heat resistant. EpoxAcast® 670 HT is ideal for making vacuum form molds, foundry patterns, forming dies & fixtures, hard rollers, industrial parts and high impact tools. EpoxAcast® 670 HT is also suitable for encapsulation applications or for use as a high temperature epoxy adhesive for bonding a variety of surfaces. an epoxy casting compound which offers high heat resistance up to 350° F/177° C if post cure schedule is used. EpoxAcast® 670 HT features a relatively low viscosity that ensures minimal bubble entrapment. EpoxAcast® 670 HT also offers an extra long working time of 3 hours. 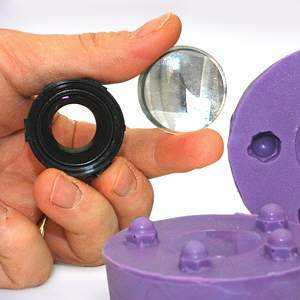 UV resistant clear casting epoxy resin for applications requiring a rigid, clear finished product. Set 1,18 kg. UV resistant clear casting epoxy resin for applications requiring a rigid, clear finished product. Set 4,71 kg. UV resistant clear casting epoxy resin for applications requiring a rigid, clear finished product. Set 20,63 kg (15,88 kg A + 4,76 kg B). a clear, water-like liquid that will lower the viscosity of Smooth-On casting and laminating epoxies. Preparation– Avoid breathing fumes - use in a well ventilated area at minimum. NIOSH approved respirator is recommended. Wear safety glasses, long sleeves and rubber gloves to minimize skin contact. Materials should be stored and used in a room temperature environment (73°F/23°C). Elevated temperatures will reduce pot life. EpoxAcast® 670 Resin and Hardener must be properly measured and thoroughly mixed to achieve full, high-strength, solid-cure properties. Pre-mix Part A Thoroughly - Separation may have occurred in transit or storage. Pre-mix for 2 minutes prior to dispensing to a uniform consistency using a straight edge paddle (paint stirrer) or turbo mixer (drill attachment). Measuring / Dispensing – Accurate measurement by weight is required for the material to cure properly and develop full physical properties. Dispense Parts A and B in proper proportions into clean plastic, metal or wax-free paper containers. You must use an accurate scale (gram scale or triple beam balance scale) to weigh these components properly. Do not attempt to measure components by volume. Adding Color & Fillers - EpoxAcast® 670 HT can be colored with SOStrong® color tints (from Smooth-On). Pre-mix tint with Part A thoroughly and then add Part B. A variety of dry fillers can also be added. Pre-mix dry filler with Part A before adding Part B.
Vacuuming - EpoxAcast® 670 HT is low in viscosity compared to other epoxy cating systems and does not require vacuum degassing. If you choose to vacuum the material, subject mixture to 29 h.i.g. mercury in a vacuum chamber until mixture rises, breaks and falls. Allow for 5 times volume expansion in mixing container. 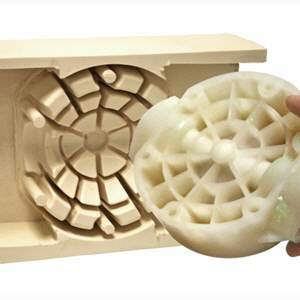 Pouring – If casting EpoxAcast® 670 into a rubber mold, pour mixture in a single spot at the lowest point of the mold. Let the mixture seek its own level. A uniform flow will help minimize entrapped air. Cure Time: Refer to specified Cure Times in Handling Properties section. Cured material will be hard and unable to penetrate with a finger nail. Cured epoxy can now be dry sanded. If machining or sanding, wear NIOSH approved mask to prevent inhalation of particles. Pot life and cure time values are dependent on mass and mold configuration, as epoxies are mass-sensitive. 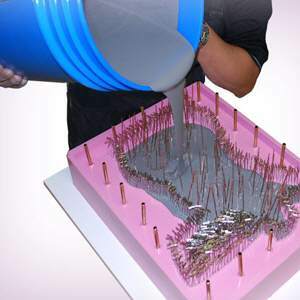 Heat Curing - For best results, EpoxAcast® should be heat cured in an dedicated oven. Cure at 175° F / 80° C for two hours, followed by three hours at 300° F / 150° C. Allow material to cool to room temperature before use. Painting – Cured EpoxAcast® can be painted or primed and then painted with acrylic enamel paints. Let paint fully dry before putting part into service. Removing Epoxy – Uncured / Non-curing epoxy: Scrape as much material as possible from the surface using a scraper. Clean the residue with E-POX-EE KLEENER®, lacquer thinner, acetone or alcohol. Follow safety warnings pertaining to solvents and provide adequate ventilation.